Microsoft Word's spell checker includes the most common words for the supported languages (like English). Whenever you check your document for mistakes, you can make Word 2010 recognize new / unrecognized words highlighted in red squigly underline by right-clicking on them and choosing "Add to Dictionary" from the context menu. Behind-the-scenes, this creates a new entry in a file called CUSTOM.DIC, which stands for " custom dictionary ": it's just a text file containing a list of words and acronyms. There are two ways to add new words as a batch to this dictionary: click on the File button (top left), and choose "Options". Select "Proofing" options on the left, and click on the "Custom Dictionaries" button. The Custom Dictionaries dialog will open, and showing dictionary files associated with your profile. You can add or delete new ones all right from here! To add new words one by one, just click on the Edit Word List button: any word manually add won't be caught as misspelled any longer. 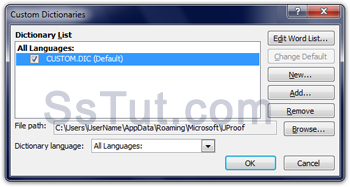 The folder location where your custom.dic file is saved is displayed next to "File path", and will look like "C: \ Users \ UserName \ AppData \ Roaming \ Microsoft \ UProof" (where " UserName " is your actual Windows user name). Drag with your mouse to select the path: right-click on it and choose "Copy". You can now open that folder in Windows Explorer: just paste the path in the start menu's search field, and hit Enter. Double-click on your custom.dic file to edit its content: choose Notepad, or another text editor of your choice (the first time you try to open a *.dic file, Windows will ask you which program to use to view it, but only the first time). The icon shown for the file will be set by the application you use as default file handler (TextPad, in our case). You'll see a list of words, one per line: if your dictionary file is empty, don't worry: it just means that you haven't yet added words. Type one word after the other, hitting Enter between each one, or paste a list of words from another source as a batch. When you are done, click Yes to saving the file when you close the editor. The next time you spell-check a Word document, the new words you added will no longer be flagged!